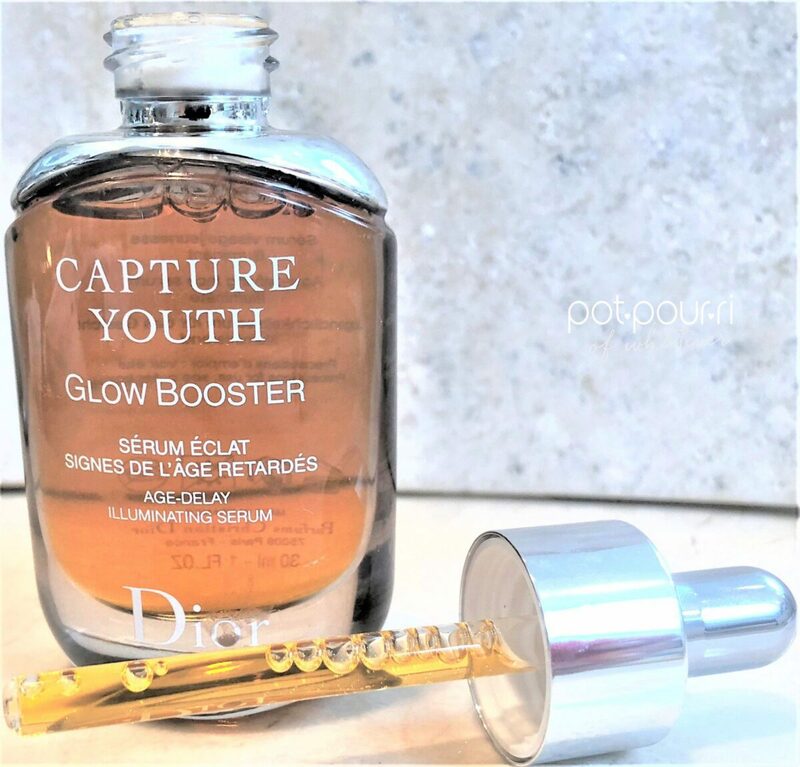 “The time is now to stay young longer.” According to Dior Cosmetics, Capture Youth is the remedy to “stay younger-longer!”. 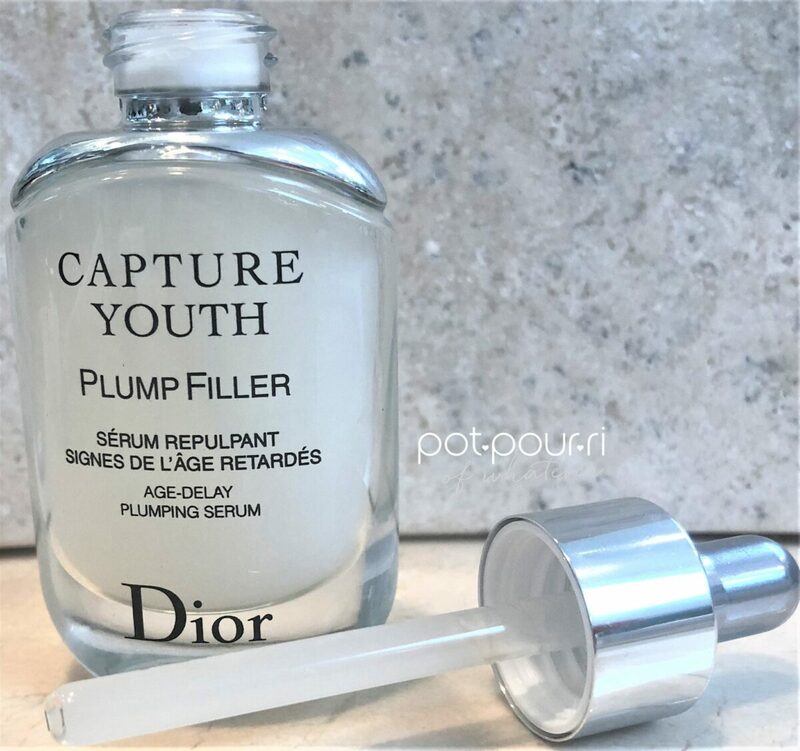 First of all, Dior claims that Capture Youth is capable of delaying the signs of aging even before they appear. Specifically, Capture Youth includes five serums. Each serum has a star ingredient that targets and treats a specific skin concern. Accordingly, these concerns include a specific serum. In addition, the serum targets a specific skin problem. Particularly, each serum will either lift, matte , soothe or plump the skin. For example, my skin concerns include the loss of volume in my face, and lackluster, aging skin. 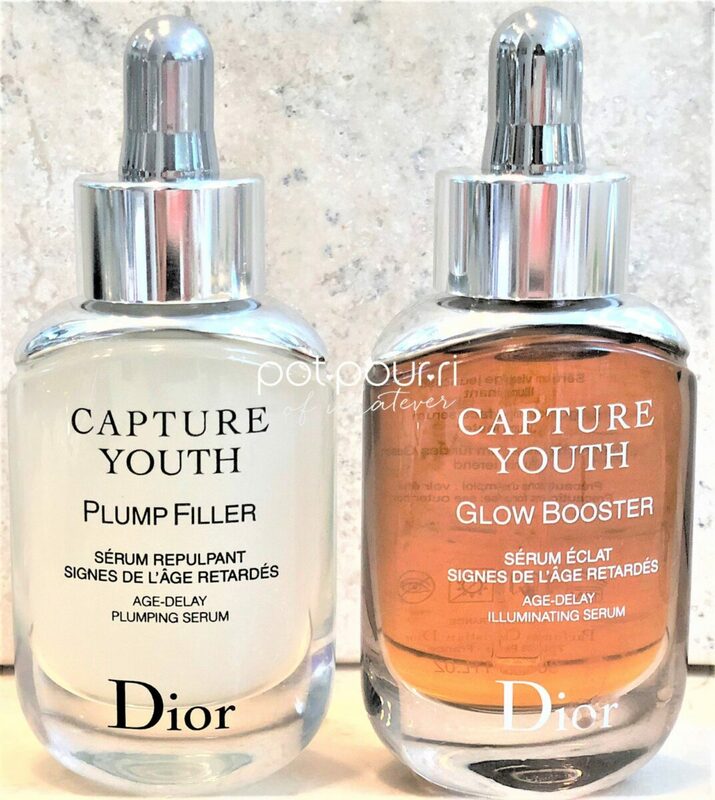 Therefore, I purchased two of the five Dior Capture Youth formulas, Plump Filler Age- Delay Plumping Serum ($95) , and Glow Booster Age-Delay Illuminating Serum ($95). Indeed ,the Serums’packaging is pretty and elegant. Transparent, weighted glass holds the serum. Also, the bottle has silver on the top. In addition, built into the silver lid is the dropper applicator. In order to apply the serum, there is a squeeze mechanism on top of the cap. It looks like the rest of the bottle’s silver adorned plastic silver. However, the silver squeeze mechanism on the dropper is also silver. And, it appears to be metal. Actually, the silver dropper mechanism is rubber. Capture Youth Serums may prevent the further affects of aging resulting from a weakened antioxidant system. First, our body’s antioxidant system weakens over time. As a result, our skin can’t resist everyday aggressors like stress, pollution, or UVs. Therefore, early visible signs of aging, skin dullness, lack of plumpness, lines, redness, and clogged pores, occur. 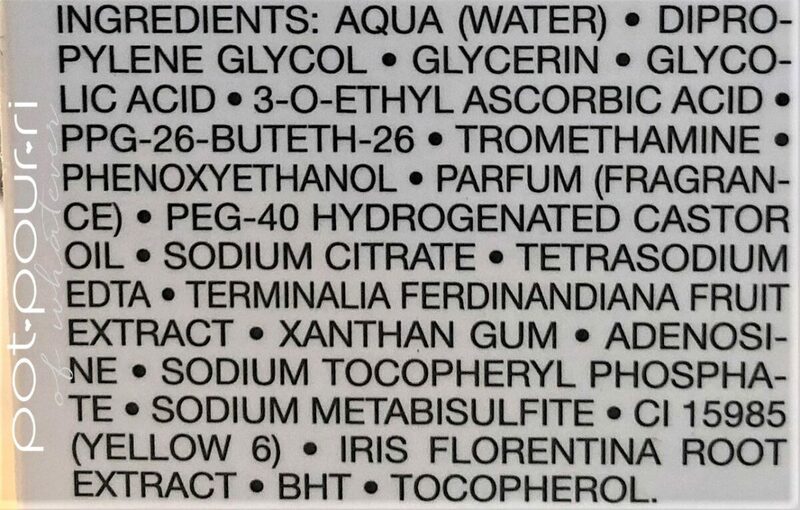 For these reasons, one of the ingredients in all five serums is Active Iris Extract. Also Proven, by scientists, Iris Extract can double the antioxidant potential of the skin . In other words, it targets aging even before the signs appear. 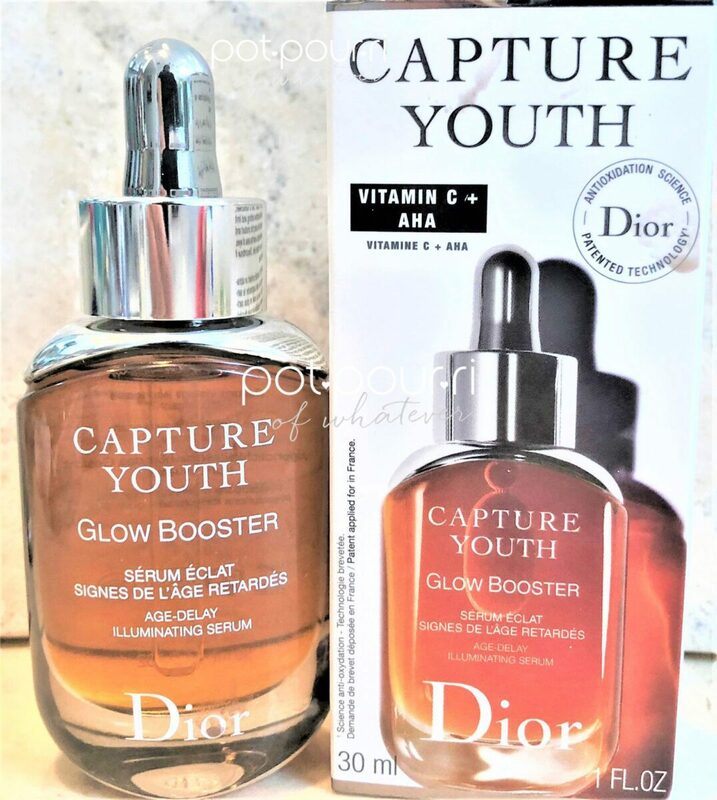 Dior Capture Youth Serums have a Star ingredient. The Star ingredient in Plump Filler is Hyaluronic Acid. 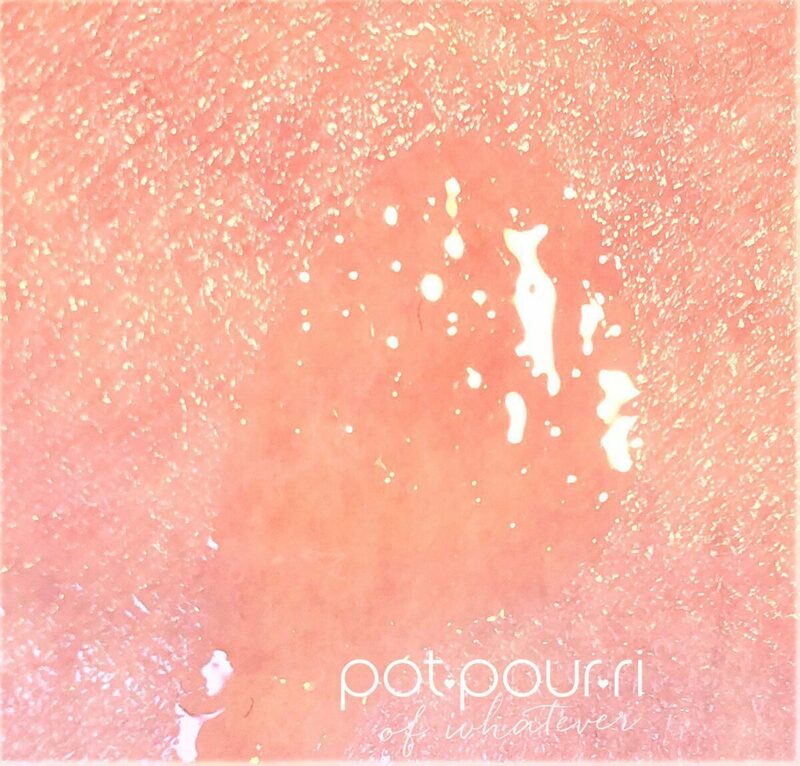 Also, powerful natural-origin ingredients fuel the five serums. Most important, each serum also has a star ingredient to target a specific problem. Last, the serums create a defense system against outside aggressors. 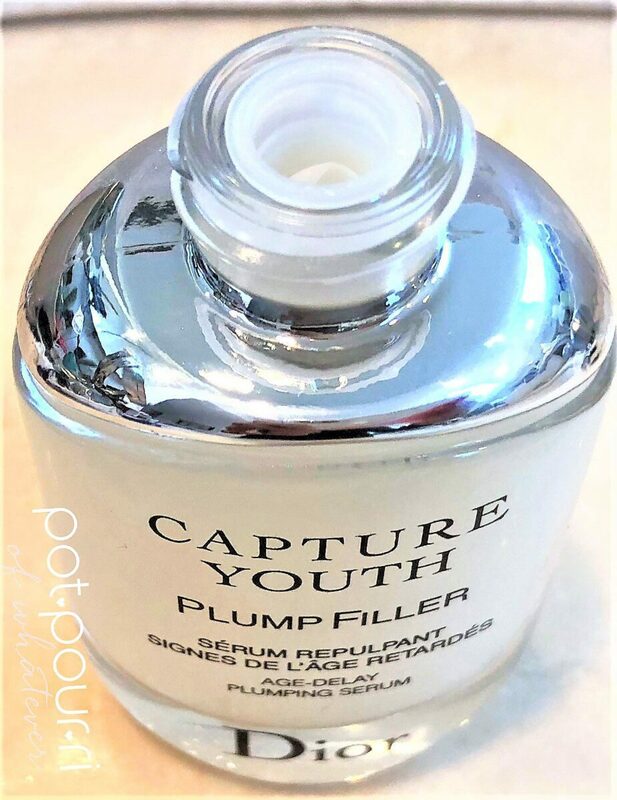 Plump Filler Serum moisturizes and plumps the skin. Hence, the skin appears fuller and more supple. 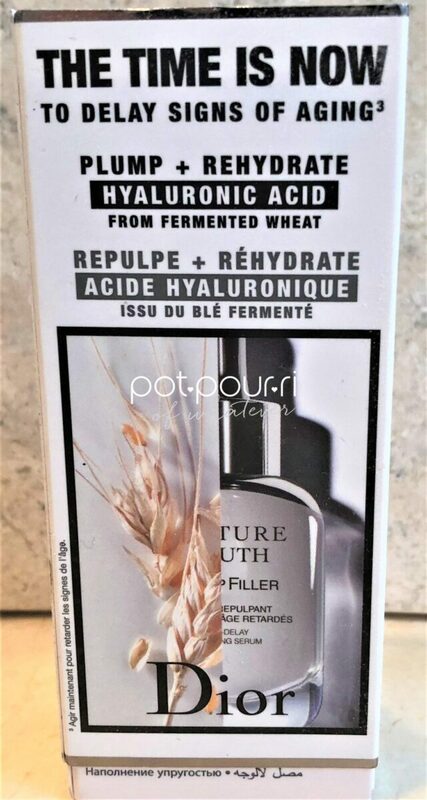 The star ingredient in Plump Filler Serum, made from fermented wheat, is Hyaluronic Acid. Furthermore, the hyaluronic acid molecules have different molecular weights. As a result, skin becomes re-hydrated. Also, the different molecular weights restore the suppleness of the skin. First, the serum absorbs quickly into the skin. As a result, skin appears plumper, smoother, and more youthful looking. Clearly, the purpose of the serums is to delay the signs of aging before they appear. In order to do this, the formulas need to combat aggressors such as stress, fatigue, pollution, UV rays and jet lag. However, fragrance does not benefit skin. Nor does fragrance delay the signs of aging. In fact, fragrance irritates your skin. And, the formula has a heavy scent. Another ingredient that causes irritation is Iris Root. Most important, you can not get the same result from Plump Filler Serum, or any serum, than you get with fillers from dermal injections. First of all, dermal injections reach deep into the skin. Therefore, injected fillers are the only way to fill the areas of the face that have lost volume. Moreover, it is impossible to fill the areas that have lost volume from the outside in. As a result, serums do very little to make skin look fuller. 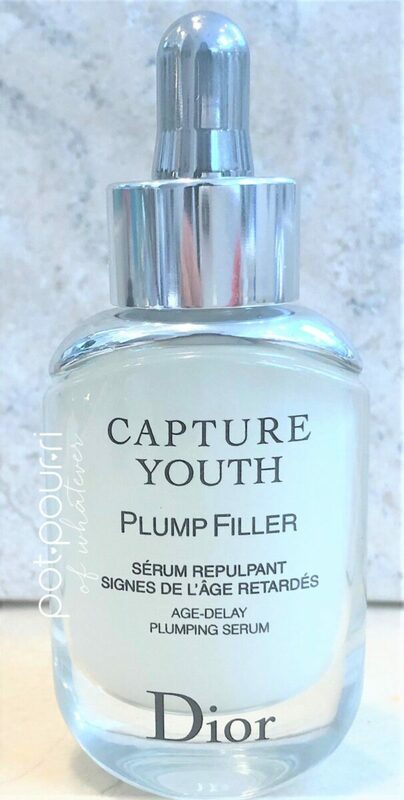 Last, compared to similar target specific products out there, Capture Youth Plump Filler Serum is way too expensive! For example, Bobbi Brown Skin Reviver No 91 is also an antioxidant-rich remedy. It also plumps, smooths and repairs the skin. And, it costs $45. 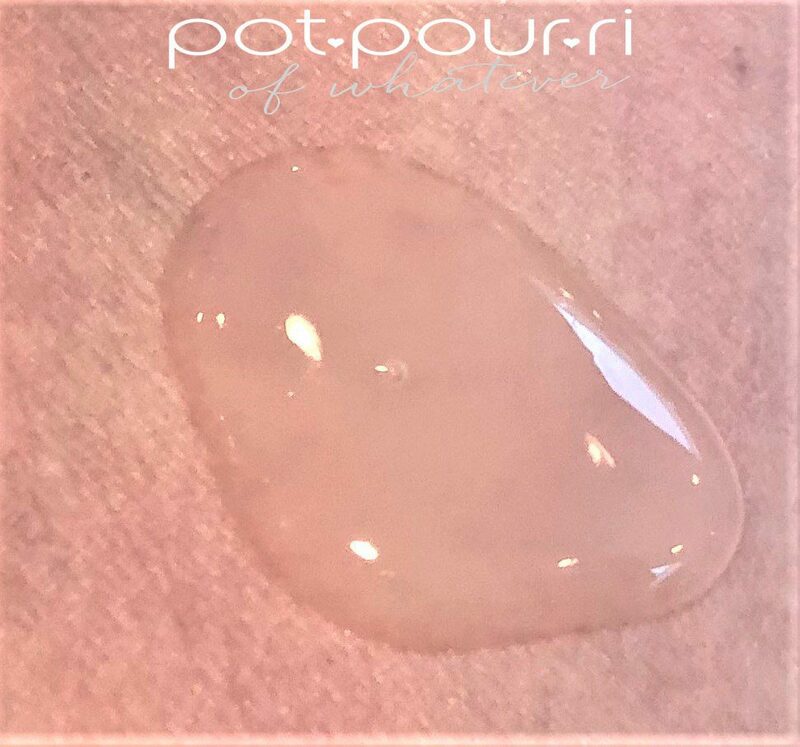 Another Brand, Ordinary by Decium, combines 3 molecular weights of hyaluronic HA cross polymer at combined concentrations of 2% for multi-depth hydration. Also, included, vitamin B5 provides even more hydration. 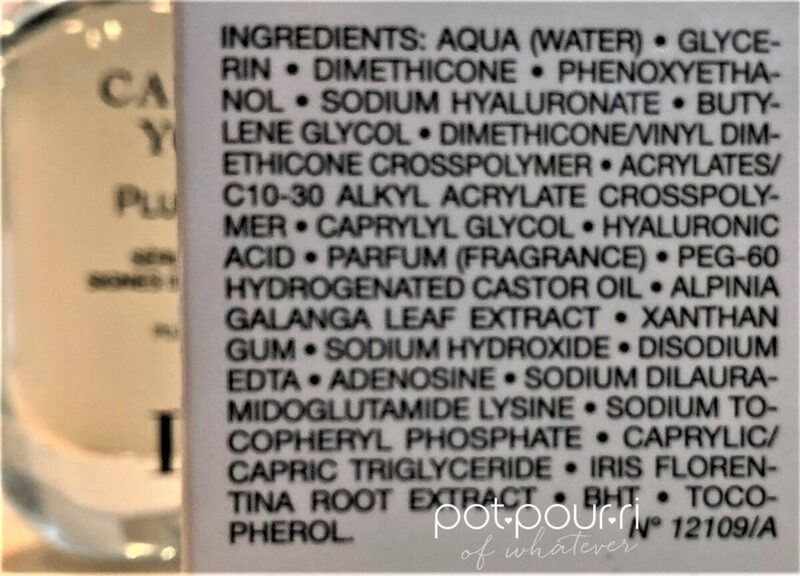 Surprisingly, the cost for Ordinary Hyaluronic Acid 2% + B5 is $6.80. Furthermore, Decium’s Hylamide Sub q anti-age solution for multi-depth rehydration costs $38. Glow Booster Serum is for skin that is lackluster. The formula includes Star Ingredients Vitamin C Derivative, and Glycolic Acid to hydrate, brighten and shine the skin. In fact, the vitamin C is from the Kakadu Plum. The reason for this is the Plum has 100% more concentrated vitamin C than an orange. Most important, the vitamin C infused formula gives the skin an immediate dose of radiance. The serum is weightless and super silky. Therefore, the formula’s light weight texture layers beautifully with other skincare products. Moreover, Glycolic Acid exfoliates the skin , removing dead skin cells, to combat a dull complexion, and even out skin tone. Again, fragrance in the formula runs the risk of skin irritations. Furthermore, Iris Root is also a skin irritant. In addition, the transparent bottle may possibly make the vitamin C unstable. Therefore, once it becomes unstable, it is not longer effective. Finally, $95 is way too expensive when you can purchase similar products from other brands. For example, Ordinary Vitamin C Suspension 23% + HA spheres 2% is a high-end skincare dupe. Furthermore, it costs just $5.80 for this pure form of l-absorbic acid. Ordinary has a new form of Vitamin C, which is 100% l-absorbic acid powder. Moreover, it costs $5.80. Also Bobbi Brown Remedy No 45 is a skin brightener that adds luminosity and radiance to your complexion. Luxury products never make anyone beautiful. Furthermore, sometimes you are paying for great advertising and packaging. However, the product isn’t so great! I am not thrilled with these Serums. First, they really aren’t giving us anything that has already been done. However, in my experience, the products that had already existed are not only better they are cheaper. Oh, I forgot to tell you that Dior recommends using these serums with the Dior Capture Youth Age Delay Advanced Cream. In fact, both products were designed to go together. And, they are supposed to make each other more effective. Really?????? Moreover, the Advanced Cream costs another $95. So, you are paying $190 for two products that really are not worth it! Just because they say Dior! Just because Dior spent too much money to advertise them, and package them. Hey, that is what you are really paying for! O.K? Just wear a sunscreen and you can delay aging! Instead of delaying aging, I want products that can reverse aging. Preventing aging or a cure? Which one would you like? How about Both!!!!! What do you think? Let’s chat in the comments below!!! !